Originally published 03/30/18, 1:00PM CDT. GENEVA, ILLINOIS — The Chicago Steel Hockey Team, reigning Clark Cup Champions and members of the United States Hockey League (USHL), announced Friday that the club is hoping to sign Scott Foster, who stopped all seven shots he faced in last night's 6-2 Chicago Blackhawks victory over the Winnipeg Jets, as the team's emergency accountant. "If Scott can handle itemized deductions as well as he handles a Dustin Byfuglien slap shot, he'll be a great asset," said Steel President Dan Lehv. Foster served as the emergency goalie for last night's Chicago Blackhawks/Winnipeg Jets game at United Center and was summoned into action early in the third period when Blackhawks netminder Collin Delia left the game due to cramps. He capitalized on his first NHL action and secured the victory. The Steel were impressed with the circumstances surrounding Foster's appearance. "To perform like he did, in the height of tax season, really showed us how well he can balance things," said Lehv. USHL league eligibility rules prohibit Foster from playing goalie for the Steel. USHL players are between the ages of 16-21 with more than 95% receiving NCAA Division I opportunities, and over 250 USHL alumni currently under NHL contract. "Overall, our starting accountants have been doing a good job for us," said Lehv. "But as we all know, anything can happen in the crazy, fast-paced world of accounting. Last year's Academy Awards are a prime example. We couldn't see a guy like Scott Foster misplacing the Best Picture envelope. He seems like a 'no loopholes' kind of guy." 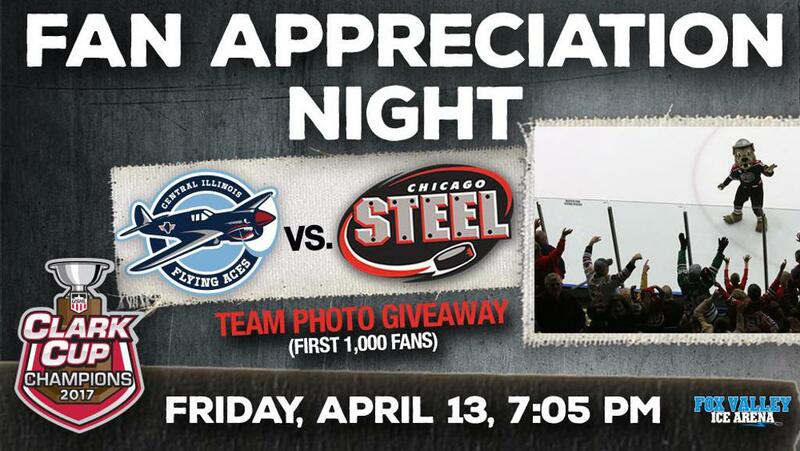 The Steel have invited Foster to attend their final regular season home game on Friday, April 13 when the Steel host the Central Illinois Flying Aces on Fan Appreciation Night. "We'd love to get Scott here to drop the ceremonial puck, enjoy the first period, and then dive into our 2017 returns during the remainder of the game," said Lehv. Fan Appreciation Night will feature a team photo giveaway to the first 1,000 Steel fans and prizes given away all night long from the Steel and corporate partners including gift cards, unique fan experiences and more. Six games remain in the regular season for the Steel, with five of those games taking place on the road. The Steel, who currently sit in the sixth and final playoff position in the Eastern Conference, visit the Flying Aces tonight at 7:07 p.m., followed by a 7:05 p.m. showdown Saturday night at the Cedar Rapids RoughRiders. Steel games are carried live on Mixlr (free audio) and HockeyTV (iPPV). For more information, visit ChicagoSteelHockeyTeam.com/broadcast. Chicago's lone remaining home game of the regular season is Fan Appreciation Night, April 13 against Central Illinois. For more information, or to purchase tickets, call 855-51-STEEL, stop by the Box Office at Fox Valley Ice Arena or visit ChicagoSteelHockeyTeam.com.